Spring and summer come with some delicious seasonal produce, like bok choy! Bok choy is a member of the cruciferous vegetable family (along with kale, cabbage, cauliflower, broccoli) and is a good source of vitamins and minerals like magnesium, calcium, vitamin A, and vitamin C- amongst others. 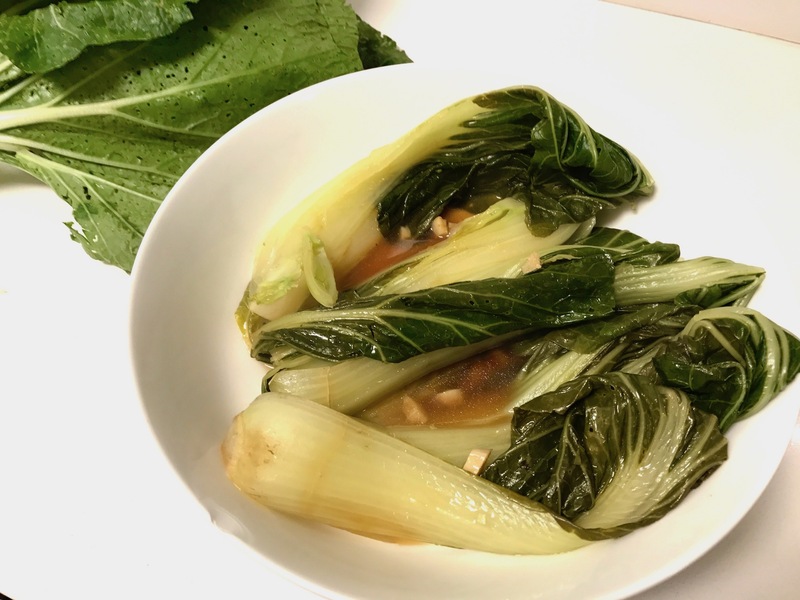 Bok choy isn’t a veggie I usually make because honestly, I don’t love it- however, I made this yummy recipe because I got bok choy in my seasonal veggie share (that started last week, and I’m so excited about it! )- and it’s pretty darn good. Try making this recipe for your family parties or even a simple weeknight meal- it’s pretty tasty! Wash and prepare the bok choy. In a large pan (you may need two- which is why so many of the ingredients are divided! )- heat the avocado oil until hot- 2-3 minutes. Add the garlic and the bok choy to the pan (or pans) on medium heat and allow to cook for 1-2 minutes. Next, add the water and the tamari, then cover the pan or pans with the lid and allow to simmer and cook for 20-25 minutes or until the bok choy is soft and cooked.